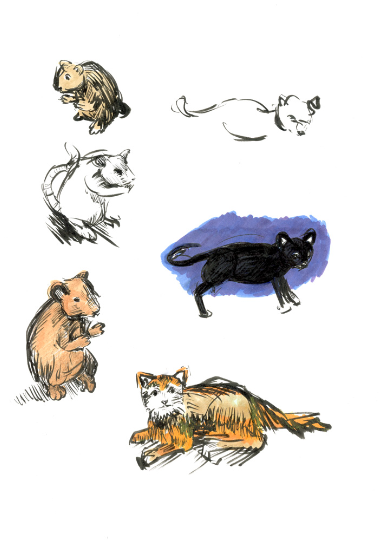 This is a design document for Basho & Friends, an in-progress interactive children’s book. Here, children ages 8—13 can walk in the path of Basho, the legendary founder of haiku poetry—and become poets themselves. Basho & Friends is a collaboration between Joshua Korenblat, Assistant Professor of Graphic Design at the State University of New York at New Paltz; Julie Finton, artist and longtime English as a Second Language instructor at the Pratt Institute in New York City; and Sweta Pendyala, an engineer and children’s book adherent. To paraphrase the poet John Ciardi, this project is an example of greening the field of ideas—imagining new possibilities based on past forms and ideas. We believe that Basho’s principles can help promote literacy and sustainability for underserved communities through the mediums of haibun and haiku poetry. As an academic project, I’m intending to promote this as an idea for a convivial tool—a way for children to become producers of unique creative works and not just consumers while engaged in digital media. Here, design becomes a platform founded on values that promote literacy and sustainability. I noticed a need for this project when I taught English Literature high school students who struggled with literacy. Many of them could not identify with the authors and settings of the texts we introduced. That ability to see yourself as an author, and to walk alongside and create with that author, creates a memory that could sustain enthusiasm for reading and writing in later years. After my teaching, I worked on a design project about the achievement gap in US schools. I noted correlations between the achievement gap and a lack of enrichment opportunities, a stressful and environmentally challenged living environment, and a lack of books at home. The achievement gap, in fact, opens up even before a child’s first day of school. This collaborative project is one attempt I can make as a designer to promote values for reading and writing on behalf of the young people I once taught. We welcome feedback as this creative writing and design project continues to evolve. Please see some wireframes by Julie Finton: these are in-progress mockups. This PDF shows the wireframe paths by Julie Finton. Value proposition: how might this design idea heal pains and create gains for young learners? Emphasize the positive in the form of life-affirming visual feedback, rather than violent or destructive results of user actions. This is a rough draft of the youthful characters. We may age them a bit more so that they’re slightly older than the players themselves, and the style is subject to change as well, pending feedback and further thinking. They may have a slightly more realistic look-and-feel, like the characters in Hergé’s Adventures of Tintin. These characters represent some of the key figures the player will encounter: young Basho, his friends Yoshi and Satoko, a typical villager, and Yoshi and Satoko’s samurai father, who overlooks the village. This a rough draft of the characters. The design style may evolve into a more realistic one pending feedback. There can also be many other animals in this world, as evidenced by the collectibles, which include animals that also double as season words in traditional haiku poetry (for instance, we know a robin also signifies spring). The frog lives in the pond; the rabbit, the fields. They also signify spring. The deer have a mournful call in the autumn forests. The bear sometimes wanders into the blueberry bushes on the transition between fields and forest. This transitional space has the most environmental diversity. The Japanese woodpecker can be heard tapping in the treetops. The snow monkey enjoys wintertime in the forest as well. Haiku are about attentiveness and observation. For that reason, while our main characters might be a bit more cartoony or abstracted, the animals in the environment, and the landscape itself, should be more pictorial and realistic. This type of balance can be seen in classic illustrated works such as Hergé’s Adventures of Tintin. The sketches below explore a more realistic look. Click on them to enlarge. The game map will be accessible in the user interface and will be functional, making it easier to navigate from one space to the next. Players can explore Basho’s world around Ueno Castle with his friends Yoshi, Satoko, and the animals. Each animal inhabits a unique environment: pond, fields, and forest. In these environments, players can collect items for a season journal based on what they observe. Note the growing wooden village that’s encroaching the flower and grain-filled fields. Villagers are beginning to manipulate the streams and cut down the trees. The goal: create haiku that help the villagers appreciate nature the way the animals do so they too can live in harmony with nature. Collectibles help a player fill up the scrapbook in their seasonal journal—images encountered through the gameplay that can be turned into words used in poems. An example of the seasonal journal is shown below. This contemporary example of a seasonal journal comes from Write Your Own Haiku for Kids, by Patricia Donegan, Tuttle Publishers, 2018. This is an excellent read. Donegan provides inspirational scaffolding for writing haiku in the tradition of poets like Basho, but with refreshing fun. Collectibles in the game environment. You can sort by season, type, location, and sense. 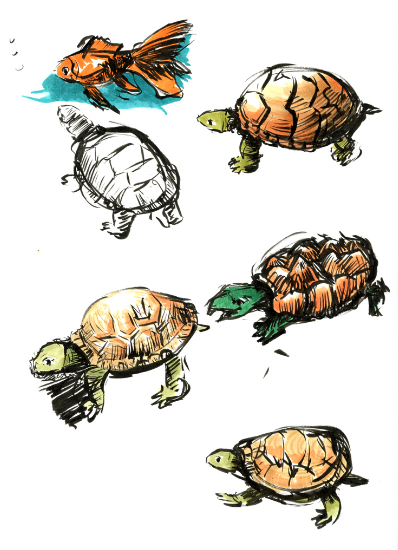 These sketches are exploring the environment for the game. We intend the game to look like 2D art, either actual photo and illustration hybrids, or the kind found in classic illustrated books, but with depth and multiple planes, as in this parallax scrolling example from Google Doodle about Leo Tolstoy. The environment will need to be rich enough to accomodate exploration and magnification on details. Styles we’re considering include photoillustration and Japanese prints. Read a presentation about this design idea that I gave at Penn State in July 2018. For an in-depth read about this presentation, and the research behind it, please read my Medium essay, How digital humanists might help close gaps in learning experiences.